Deven Bridges posed a question Sunday to a packed house at the Rhinehart Music Center on the Purdue University Fort Wayne campus after summarizing fire’s destructive power – turning homes into ash, buildings to rubble and prized possessions into dust. “What if I told you that there was a fire within your heart that, when lit, actually creates?” the Voices of Unity alumnus said during a monologue that kicked off Praise Celebration 2019. A City on Fire was the theme for this year’s concert, which included a song titled “On Fire,” red lighting and simulated flame decorations on and around the stage. 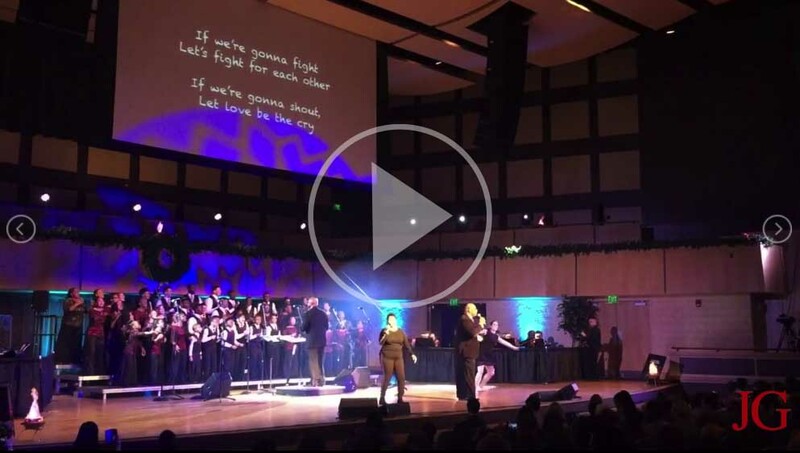 Guest worship singers, Fort Wayne Dance Collective members and musicians also performed with the choir. Marshall White, founder and CEO of Unity Performing Arts Foundation, expanded on the theme, noting organizers wanted to celebrate the vision and growth happening in Fort Wayne. “Tonight, we pray that our great city, Fort Wayne, Indiana, will be a city ‘ON FIRE’ that inspires our children and youth to live productive lives and achieve the highest level of their potential,” White wrote. A fundraiser for Unity, the concert sought to raise $10,000 from audience members, who could text donations throughout the show. The tally surpassed $5,000 by intermission. Unity plans to launch two courses for youth in February that teach the foundations of public speaking and soulful dance styles. White introduced some choir members to the audience, including Carroll senior Cydney Bridges, a longtime Voices of Unity participant who also earned the title Miss Teen Indiana. She walked onstage in a sash and glittery dress and described Voices of Unity as a blessing. She noticed something while competing in a nationwide pageant last summer, she said: many of the girls had pageant coaches. Someone asked her whether she had one. The three P’s – preparation, presentation and performance – that were drilled into her as a young member stuck with her, she said, noting the qualities go hand-in-hand with pageantry.